Sorry... the 2017 Toyota Yaris is no longer being sold as new. Instead, take the first step to a great deal on 2018 Toyota Yaris with a free price quote! 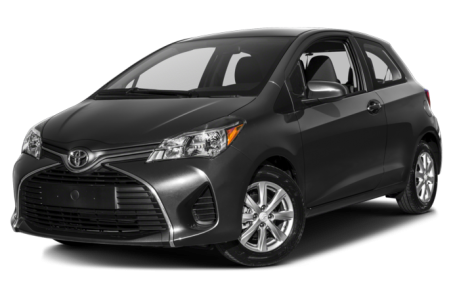 The 2017 Toyota Yaris is a subcompact hatchback with 3-door and 5-door body styles. It competes with the Ford Fiesta, Honda Fit, and Nissan Versa Note. This year, it remains largely unchanged, but Toyota Safety Sense C comes standard for all trims. The 3-door version has two trims available: the L and LE. Three trims are available for the 5-door version: the L, SE, and LE. Like a small dog with a big bark, the Yaris has a ferocious appearance for its nimble stature. The front-end features a wide-mouth opening that blends the grille and lower fascia together as well as angry headlights. The rear is much tamer with minimal ornamentation. Daytime running lights and 15-inch steel wheels come standard. Projector beam headlights, front fog lights, LED daytime running lights, power side mirrors, a rear spoiler, and larger 16-inch alloy wheels are available as well. Under the hood, the Yaris is powered by a 106-hp, 1.5-liter 4-cylinder engine mated to standard 5-speed manual transmission or optional 4-speed automatic. Estimated fuel economy ratings for the Yaris are 30/36 mpg city/highway (5MT) and 30/35 mpg (4AT). Inside, the Yaris has a standard cloth interior with a 60/40-split folding rear seat. The center stack features a standard Entune audio system that includes a 6.1-inch touchscreen, Bluetooth connectivity forp hone and audio, voice command recognition, and a USB port. Standard features include air conditioning and power windows/locks. Sport fabric-trimmed seats, sport instrumentation, a leather wrapped steering wheel, cruise control, and remote keyless entry are available as well. The standard Toyota Safety Sense C package includes a pre-collision system, lane departure warning, and automatic high beam lights. Other safety features include nine airbags, antilock brakes, and an electronic stability system.